Basically, this project is a game that I’m looking at as a closed-system card game with a card pool that players can customize their decks from. Why “customizable” instead of “collectible”? Well, because the chances of this game getting to a publisher and getting printed are so astronomically low, you can’t really collect it. The idea is that each player may use ANY of the cards in the set to construct their decks. This has the unintentional effect of making the game more competitive and fair, because each player has the same pool of cards to work with. Every game has this, and we’re getting it out of the way right now. Lots of cards specify behavior that is contradicted by the rules in the book. If a card contradicts any of the rules of this game, the card takes precedence. All cards, regardless of type, share similar information. All cards have a typeline, which displays basic information about the card (like “Character- ninja” or “Modifier- weapon”). With the exception of locations, all cards also have a cost and resource row. The cost of the card, located in the upper right hand corner, shows how many resource points are required to pay for the card. The resource row indicates how many resources the card provides when it is played as a resource. Character cards are used to attack and defend locations. A character card has three main stats: Attack, which represents the character’s power in combat, Defense, which represents the amount of damage the character can withstand, and Skill, which represents the character’s influence, trickiness, and all-around importance. If a character ever has damage on it equal to or greater than its defense, it has received “lethal damage” and is destroyed. Location cards are the objective of the game. Each location has two main stats: Skill, which symbolizes how difficult the location is to seize, and Victory points, which represents how long it takes to control the location. 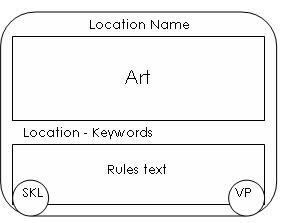 Location cards are printed in a landscape style, so they are easy to recognize. Locations are never included in a player’s deck. Modifier cards are played on other cards to change their attributes. 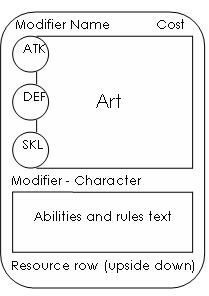 The typeline of the modifier card will let you know what card type it modifies. If the modifier card is for a character (like in the example layout), the stat bubbles will show you what stats it alters. A character may only have 1 modifier of any type played on it at any one time. If you play a modifier on a character that already has a modifier of that type, choose and discard 1 of them. 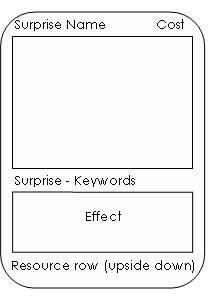 Surprise cards represent events, disasters, interventions, combat strategies, and random happenings. Unless the typeline of the surprise specifies a phase of the turn, you may play a surprise anytime, even during an opponent’s turn. When you play a surprise, follow the instructions on the card, and then place it into its owner’s discard pile. 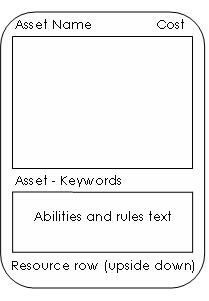 Asset cards are used to represent people, places and things that assist you in your undertakings. They usually give you or your characters passive abilities, or they may cause interference for your opponents. Each player’s side of the board is divided into several sections, or zones. Some of these zones are “visible.” For more information on card visibility, see the glossary. Deck – A player’s deck is face down to one side of the playfield. It is not visible, and no player is allowed to look at the contents of any player’s deck. If a player’s deck ever runs out of cards and a player is required to draw a card, they reshuffle their discard pile, and place it face down as their new deck. HQ – A player’s HQ, or Headquarters, is where they play their characters and assets. Cards in both players’ HQs are considered visible. Hand – While not part of the table per se, it is still considered a zone. A player’s hand is not visible, but a player may freely look through his own hand. Bank – The bank is where a player places resources belonging to him. The cards in his bank are not considered visible for play purposes, but they are face up, and any player may look through them. Discard pile – The discard pile is where a player places surprises once they are resolved, and where spent resources go to be reshuffled into the player’s deck. Cards in the discard pile are considered to be visible, and any player may look through any player’s discard pile. Void pile – The void pile is a face down pile of cards to the side of the discard pile. Destroyed characters, modifiers, and assets are placed in the void pile. Cards in the void pile are not visible, and no player is allowed to look through or reorder any void pile. Each player must construct a deck with a minimum of 40 cards. There is currently no maximum deck size. A deck cannot contain more than three copies of any one card (some cards may have abilities that alter this rule). In addition to the 40 card “Main Deck,” each player must also bring 3 different “Location” cards to the game. You’ll probably also need a handful of tokens. The objective of the game is to capture the majority of the locations in play. You do this by sending characters on missions to take the locations, and defending against your opponents’ missions. //It is important to note that these resources are currently placeholder, and will be finalized when the setting is added. When you play a card as a resource, place it in your bank, upside down, so that the resource row is displayed. Cards played as resources are treated as though they are blank in all other aspects, and their type becomes “Resource” (they do not have a title or any other stats). Multiple resource cards can be stacked so that only the resource line is visible, to make counting resources easier. When you are required to pay a cost, take a number of resource cards from your bank whose total resources equal or exceed the cost, and discard them. If a cost contains specific resources, you must use resources of that type to pay for it. Example: If a card costs “3$,” it means that to pay for it, you have to discard a total of 4 resources, and at least 1 of them must be of the type “$”. You cannot pay for more than 1 card or cost with 1 resource card; cards and costs must be paid for separately. If you overpay for a cost or card, you do not get those overpaid resources back. Cards or effects that reduce a card’s cost may never lower it below 1 resource. If an effect states “cards you play cost 1 less.” Remove a non-typed resource first, and if there are no more non-typed resources in the cost, choose and remove a typed resource from the cost. Some cards and effects will give your characters additional stats. Attack is abbreviated as Atk, Defense is abbreviated as Def, and Skill is abbreviated as Skl. If a card gives a bonus to more than one stat, it will be displayed in this format: ±Atk/±Def/±Skl (Example: A card that gives +2 to Attack and +2 to Defense will have the abbreviation “+2/+2/+0”) Any stat increase granted by a surprise or ability is temporary, and only lasts until the end of the turn. Many characters and assets in the game have abilities. Abilities are effects that are activated when you pay a cost. The costs and effects are separated by a colon. For example, an ability that reads “2: Draw a card” Would require that the controller pays 2 resource points as the cost, and the effect lets him draw a card. Abilities, like surprises, can be played at any time, but you may only play each ability once per turn. Each player shuffles their deck, and then allows an opponent to cut their deck. Randomly decide who will be the first player. The first player selects a location from the 3 location cards they brought to the game, and places it into play between the players, facing him. The second player then chooses a location from their locations, and plays it next to the first location, as a second location facing him. The first player then selects the third and final location from the 2 he has remaining and plays it in a similar fashion as the first. Take any unused locations and set them aside. Each player draws 7 cards. Starting with the first player, each player may elect to put any number of cards from their hand on the bottom of their deck, then draw back up to 7 cards. The second player takes the first turn of the game (because the first player chose locations first). Begin Phase – Any abilities that trigger at the beginning of your turn are resolved. If you control any characters not at your HQ, return them to your HQ. Production Phase – During this phase, you have 3 production points. You may use these points either to draw cards or play cards from your hand into your bank. Each point lets you draw 1 card, or play 1 card into your bank. So during this phase, you could draw 3 cards, play 3 resource cards, or any combination of the two. Also note that some abilities and surprises have a cost of “*” which symbolizes a production point. These abilities and surprises must be played during your production phase. At the end of your production phase, you lose any unused production points. Deploy Phase – During the deploy phase, you may play characters, modifiers, and assets. End Phase – During the end phase, you resolve any effects that happen at the end of the turn. Also, all damage taken by characters this turn is removed. Finally, the active player discards down to 7 cards and the turn is over. Declare attackers – Select any number of characters at your HQ and declare them as an attacking party. Move them to any one location in play. Declare defenders – Your opponent may take any number of characters he controls at his HQ and move them to the location being contested. These characters are now the defending party. Choose challenger – The attacker selects one of the characters in the attacking party to be a challenger. Oppose challenger – The defender then selects one of the characters in the defending party to oppose the challenger. Those two characters are now considered in combat. Set the two characters aside. Defender challenges – The defender now chooses a character to challenge the attacking player. Oppose challenger – The attacker then selects one of the characters in the attacking party to oppose the new challenger. Those two characters are now considered in combat. Set the two characters aside. More challengers? – If both players have characters left in their parties that are not in combat, go to step 3. Resolve combat – Once all of one player’s characters are opposed, combat begins. Any characters that were not opposed are considered “unopposed”, and are not involved in combat. Simultaneously, all characters in combat deal damage equal to their Atk to the character opposing them. This damage is called “combat damage”. If any character receives enough damage to destroy it, it is destroyed and removed from combat. Characters involved in combat remain at that location until their owner’s next begin phase. Check for victory – Now, the attacking player and the defending player total the skill on all characters they control remaining at the location. Take the attacker’s total skill at the location and subtract the defender’s total skill. If this number is equal to or greater than the location’s skill total, the attacker succeeds at attacking the location, and places one of his victory point tokens on the location. If a player ever has victory points on a location equal to or greater than the location’s “VP” stat, the player wins that location. Locations that have been won are turned face down, and all victory point tokens are removed from them (The player that won the location may place one of his tokens onto it to mark that he won it.) No player may declare attacks against a location that has already been won. When a player captures the majority of the locations currently in play, that player wins the game. Some cards may contain or make reference to words not previously mentioned in the rulebook. These are called keyworded abilities. Keyworded abilities are bold, and they give a card special attributes. Sometimes, space permitting, the rules for the keyword will be printed on the card in parentheses following the keyword, but in case it does not, here is the current list of keyworded abilities. Mob – This card costs 1 less resource to play for every visible copy of it. Unique – Only 1 copy of this card may be in play at any time. If another copy of this card is played, discard this card. Limited – You may only have 1 copy of this card in your deck. Gang – If this character is attacking or defending but unopposed at the beginning of the resolve combat step, you may add its Atk to target opposed character you control. Shielded – This card may not be targeted by effects and abilities you do not control. Recur – If this card is destroyed, place it in the discard pile instead of the banned pile. If it is discarded or KO’ed, place it in its owner’s hand instead of the discard pile. Long Range – When this character is opposed by another character, it deals its combat damage immediately. It does not deal normal combat damage. Toughness X – When this character takes enough damage to destroy it, if it does not have x wound counters on it, remove all damage from it and place a wound counter on it. Upkeep X – During the beginning of your turn, pay x or destroy this card. Giant X – This character opposes x characters, and must be opposed by x characters. Visible – Any card in play or in the discard pile is considered to be “visible.” Some cards and effects will reference visible cards. Resources in your bank are technically visible, but they have no text or attributes, other than their resource points. Resource point – One resource symbol printed on a resource. There may be more than 1 of these on any given resource. Resource – One card in a bank, being used as a resource. Not to be confused with the resource points that card is worth. If a card references “1 resource”, it refers to an entire card. Destroy – To take a card and place it in the void pile, face down. Characters are destroyed when they receive lethal damage. Not to be confused with “discard” or “KO”. KO – To take a card from play, usually a character, and place it face up in your discard pile. Discard – To take a card from your hand or bank and place it in your discard pile. Resources are discarded, not KO’ed, when you use them to pay a cost.